ENHANCE (formerly Renew Plus) is a soil management tool formulated to stimulate soil micro organisms and to enhance yields. Enhance was originally formulated for leguminous crops and has been used successfully on soybeans, dry peas, lentils, pintos, pinks and other specialty varieties. The ingredients in ENHANCE have been found to stimulate microbial processes and plant growth in numerous studies. These are discussed extensively in scientific literature. Notice the root stimulation as pictured in the soybean plant (Control on left/ENHANCE on right). Greater microbial activity in the root zone (where this product is first applied), enhances root growth and promotes better fertilizer efficiency and nutrient absorption. In three seasons of replicated studies at university research stations and private research facilities, seven research projects on soybeans have averaged a 10.6% yield increase. Recent field trials on garden beans, dry (edible) beans, and lentils have produced even higher yield increases. Do your own test: Three to four weeks following an in-furrow application of Enhance dig five to ten plants from treated and untreated fields of equal productivity planted the same day. Insure the soil ball is large enough to contain all of the roots. After gently washing the soil from the sampled plants, measure the root mass and weigh the root systems (or the entire plant) and compare values for treated vs. untreated plants. Check the Crop Programs or call us for application rates on your crop. 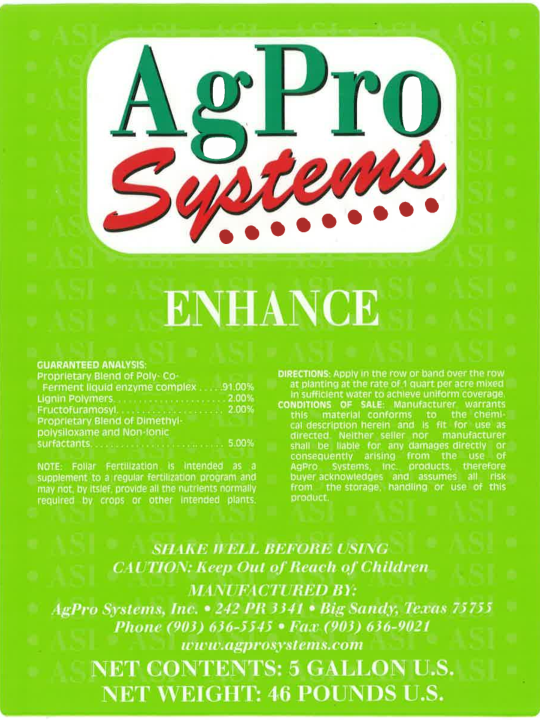 ENHANCE is an AgPro™ Systems product formulated for soil application on legume crops. It is a proprietary blend of fermentation extracts, organic acids, plant extracts and surfactants. The surfactants insure efficient penetration into upper soil horizons, while the other components affect beneficial soil microbial processes and promote early seedling vigor and root growth. The label ingredients of ENHANCE have been found to stimulate microbial processes and plant growth in numerous studies, and they may be found discussed extensively in scientific literature. There are hundreds of references on humic and kelp extracts alone. The combination of ingredients in ENHANCE provides a more uniform and consistent soil and plant response than each applied alone. The response is due partly to the readily-available carbon and nutrients needed for microbial activity and partly to the natural biostimulant content of the formulation. Greater microbial activity in the root zone and enhanced root growth lessens the effect of compaction and promotes better fertilizer efficiency and nutrient absorption. This may be observed in field comparisons made starting three to four weeks following an in-furrow application of Enhance. Simply dig five to ten plants from treated and untreated fields of equal productivity planted the same day. Insure the soil ball is large enough to contain all of the roots. After gently washing the soil from the sampled plants, measure the root mass and weigh the root systems (or the entire plant) and compare values for treated vs. untreated plants. In three seasons of replicated studies at university research stations and private research facilities, seven research projects on soybeans have averaged a 10.6% yield increase. Recent field trials on garden beans, dry (edible) beans, and lentils indicate even higher yield increases. Best results are achieved with in-furrow plus banded application methods. The recommended in-furrow rate is 16-32 oz./A applied on the seed with an additional 16-32 oz./A applied three weeks later in a band to the base of the young plants. The higher rates should be used on heavier soils or if heavier-than-normal rainfall is expected. The organically modified version of ENHANCE complies with the standards of Organic Certifiers and contains only ingredients approved under the USDA National Organic Program. All ingredients that violate the regulations have been removed and/or substituted with approved ingredients to satisfy Organic Certifiers’ and USDA-NOP requirements. Please specify ‘organic’ if you wish the organic formulation. The guaranteed analysis and MSDS will be included with shipment. Shake well and mix in enough water to distribute evenly. Can be tank mixed with most liquid fertilizers and pesticides. Use in in conjunction with a good soil test and soil fertility program. Always conduct a compatibility test prior to mixing any chemicals. Add Enhance and mix with normal agitation.